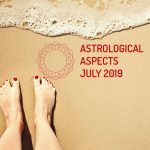 July 2019 comes with a lot of force and brings with it two new eclipses of the series Cancer – Capricorn, in addition to the retrogradation of Mercury in Leo (03/07) and Cancer (19/07), and the apparent retrogression phase of Chiron in Aries (from 08/07). What does this mean in terms of the astrological transits of July 2019? The total eclipse of the Sun in Cancer (02/07) refers us to significant changes in the home or family environment, while the partial eclipse of Full Moon in Capricorn, speaks of the feeling of loss of control. On the other hand, the retrogradation of Mercury in Leo and Cancer, points out the blockages that interfere in the authentic expression of the I, associated to personal beliefs (inherited) and the traps of the ego. Likewise, the apparent regression phase of Chiron in Aries will reflect the lack of confidence in your own decisions (insecurity), and the complexes that prevent you from taking the initiative, to defend your proposals. Here are some of the planetary events that will affect the astrological transits of July 2019. Ambition. Arrogance. Interest in showing individual abilities and imposing opinions over those of others. Discomfort at feeling ignored. The total eclipse of Sun in Cancer, in July 2019, is an invitation to connect with the inner child, and be your own mother (attend to real needs, not whims). Another aspect that will be exposed with the solar eclipse, is how much of your current behavior responds to your essence, and not the expectations of others (in this case, the family clan). Finally, the solar event promotes structural reforms in the home of residence, or transactions involving the family property (purchase, sale, rent). Defensive attitude. Wounded vanity. Prejudices affect the perception of reality, invalidating the process of analysis. The individual can believe himself to be the owner of the absolute truth and act autocratically. Chiron’s retrogradation in Aries, during July 2019, marks an excellent period to study the motivations, which are hidden behind the fact of defending more the causes or injustices of others than one’s own. This stellar transit reveals personal insecurities, which makes it impossible to trust one’s own decisions (or ideas), and to assume the corresponding leadership role. An eclipse of Full Moon brings us to the conclusion of a situation. On this occasion, when it occurs under the influence of Capricorn, it is about the closure of a professional project (to move on to the next level), a change of job, or the acceptance that you cannot control everything that happens around you. In the same way, the lunar eclipse points to the release of preconceived ideas regarding success, social status, the exercise of authority, and that which interferes with your purpose. Emotional instability. Subjectivity. High sensitivity. A nostalgic vision of the past can play a trick on you (especially with Neptune retrograde in Pisces). Beliefs imposed on the family nucleus are put to the test. Confidence to overcome the mishaps of everyday life. Connection with natural talents. Creativity. Romance. Desire to stand out. Opportunity to participate in recreational activities. Overflowing imagination. Good memory and retentive. Dexterity in artistic activities or linked to historical research. Preoccupation with the future (and the unknown). Difficulty in reconciling logic with the emotional aspects of personality. It is important to work in the consciousness of the present moment.